His final novel AND the new leader in the "Best Title of the Year" contest here at WORD. You've just got to love the books that literally sell right out of the box, and this was one of those this week, thanks to Anna's love for Ogawa (you may remember her The Housekeeper and the Professor from last year). Being as it is Passover, this is the most important week of the year to find out: is a banshee kosher? what about a mermaid? or a Mongolian death worm? or Bigfoot? or an ouroboros? This is the only book that will tell you for sure. Another book that answers an important question, but unfortunately, with more questions. 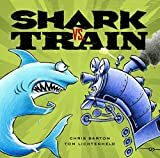 What should be simple--who would win in a competition, a shark, or a train?--turns out to depend on whether they are on a seesaw, eating pies, bowling, playing hide-and-seek, or running lemonade stands. This is technically a children's book, but we won't tell if you buy it for yourself. Normally, trends in publishing get old very quickly when you work in a bookstore and see them constantly. But if loving the trend of gorgeous new covers for beloved classics is wrong, I don't want to be right.